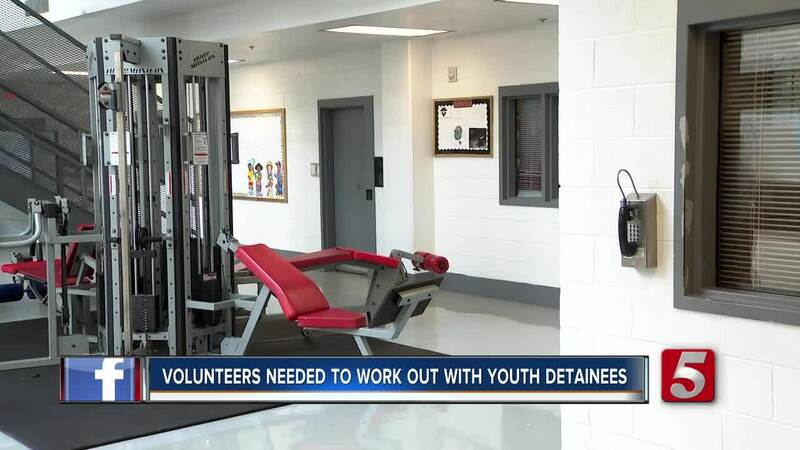 NASHVILLE, Tenn. (WTVF) — Program facilitators at the Davidson County Juvenile Detention Center are looking for volunteers to workout with youth after gym equipment was donated to the facility. "It feels wonderful that we have some people that are concerned about our youth and that we can work together and accomplish some things for our youth," Assistant Director of Programs Yolanda Hockett said. Hockett said the gym equipment was donated by Bellevue Community Center. To volunteer, male and female applicants must be 21 or older and pass a screening, orientation, fingerprinting and background check. Hours to volunteer include 3:00 p.m. – 5:30 p.m. on Mondays through Fridays and 9:30 a.m. – 11:30 a.m. or 2:15 p.m. to 5:30 p.m. on Saturdays and Sundays. "This is the prime opportunity to build rapport with youth and hopefully you build a relationship with a kid that extends far beyond juvenile detention," facility administrator Adrian Cartledge said. Cartledge said volunteers do not have to be a certified trainer. The at-risk teens will return back into the community and having positive role models interact with them while in the detention center can make a difference. "Where once these youth enter back into the community they got someone that they know that they can call upon and say 'hey man, do you want to work out' and then pour those seeds in them so they won't go back down that path again," Cartledge said.